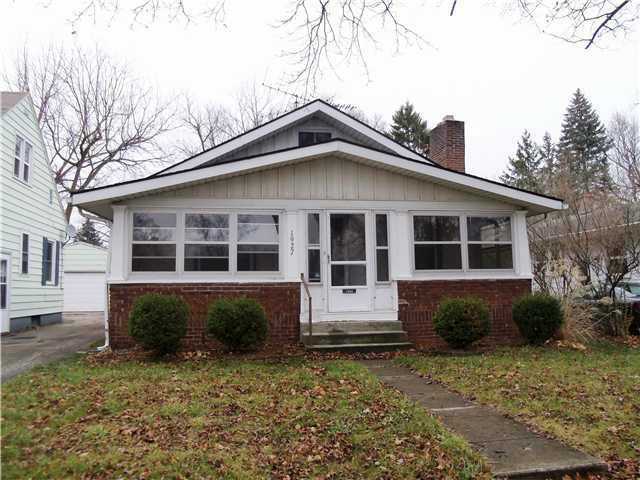 Adorable ranch style home is great for first time home buyers or those looking to downsize. The welcoming 3 seasons front porch is a great place to relax in the summer evenings. Upon entering this well cared for home, take notice of the gleaming hardwood floors and wood burning fireplace in the living room. The spacious formal dining room features hardwood flooring, built in cabinets and drawers. The galley kitchen includes the appliances and has vinyl flooring. Very low maintenance. 2 nice sized bedrooms and updated bath are on the main level. The full bath with ceramic tile flooring has a newer glass shower door and pedestal sink. The attic space has been finished and makes for great storage or playroom. This home does have a full basement and a newer furnace, hot water heater and windows. 1 car garage. The backyard is fenced in. For additional information on this property click here!